Our son loves playing with my cookie cutters – digging through the boxes, guessing the shapes, imagining his own shapes, and stealing a few for use in his play-doh. He has difficulties with eating, so I’m always looking for new distractions to get us through each meal. And, my never-ending cookie cutter collection has been working like a charm lately. All of this time spent digging through cookie cutters sparked an idea. 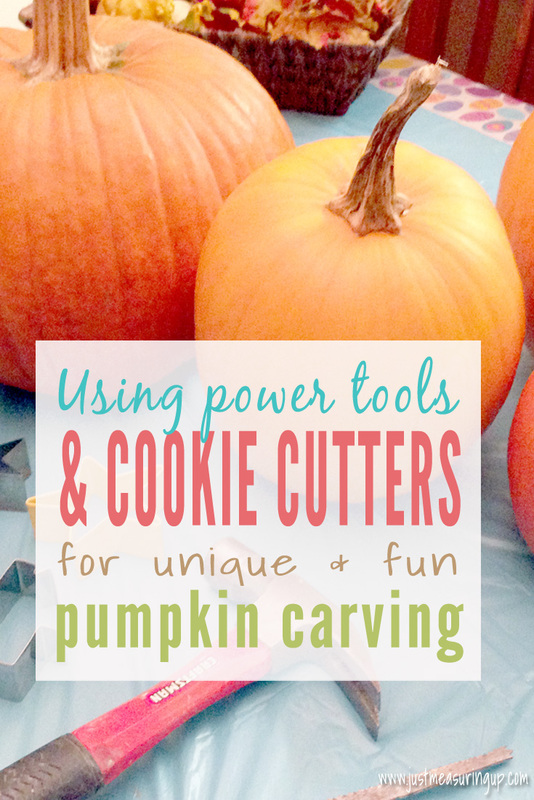 We could probably use cookie cutters to punch out shapes in our pumpkins. I googled it – and realized it was a thing. So, we picked out a few cookie cutters to get us started. As for the drill, Ash is rarely apart from his tools, and he figured that drilling holes into the pumpkins would be fun to make some cool designs. We probably should have worked outside, but it was much easier to push my son’s high chair up to the table inside. Here were our materials, plus the drill (not pictured below). 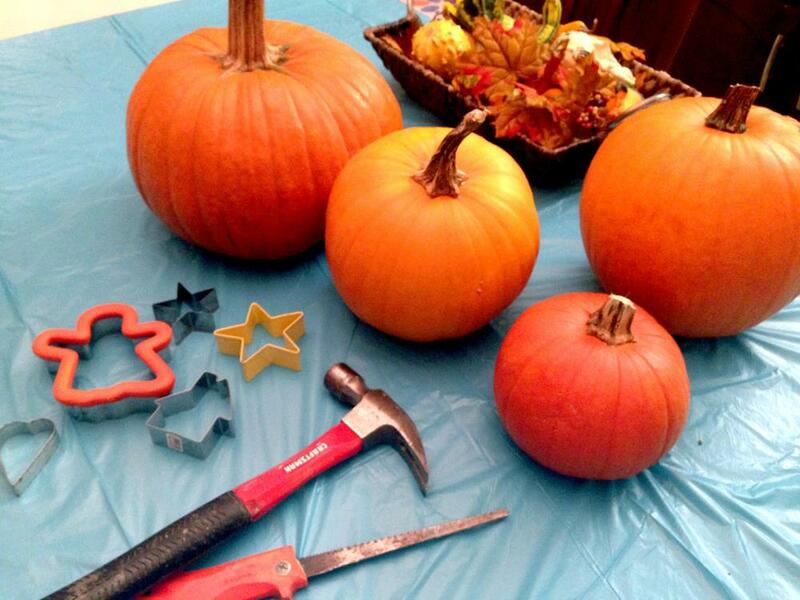 We also found that a mallet worked better than a hammer, so we swapped that out after doing the first pumpkin. After cutting open the top and scooping all the goop out, we were ready to start the fun part – hammering in the cookie cutters. 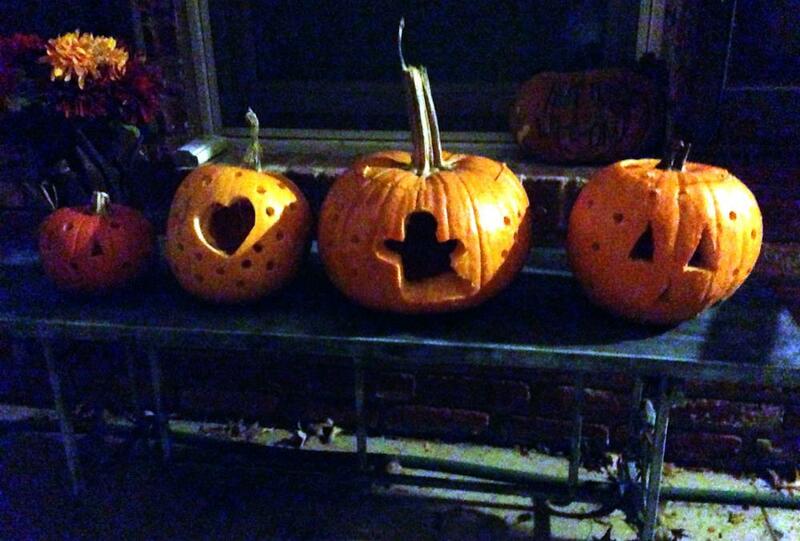 Pumpkin carving with cookie cutters was really fun, and we made lots of cool shapes. 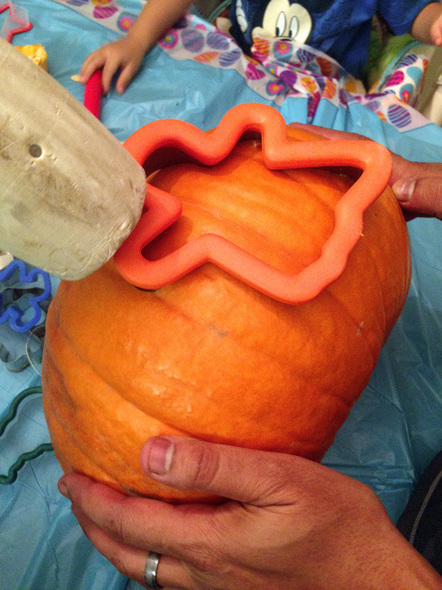 We took the mallet and tapped the cookie cutter into the pumpkin until it made a clean break. The larger the cookie cutter (like the ghost pictured above) the harder it was. This was because the cookie cutter didn’t lay flat on the pumpkin. The heart worked perfectly. 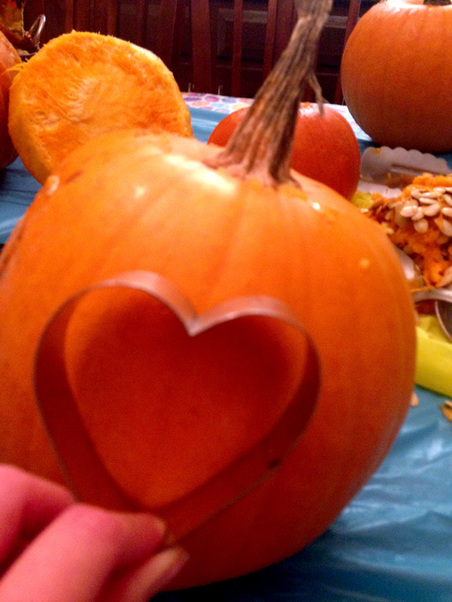 It was a good size, easy to tap in, and made a perfect heart on the pumpkin. After we used cookie cutters for pumpkin carving, we used the drill to make some designs too. We did a bunch of circles in the shape of a flower, spelled out the word Boo, and just drilled a bunch of evenly spaced circles. 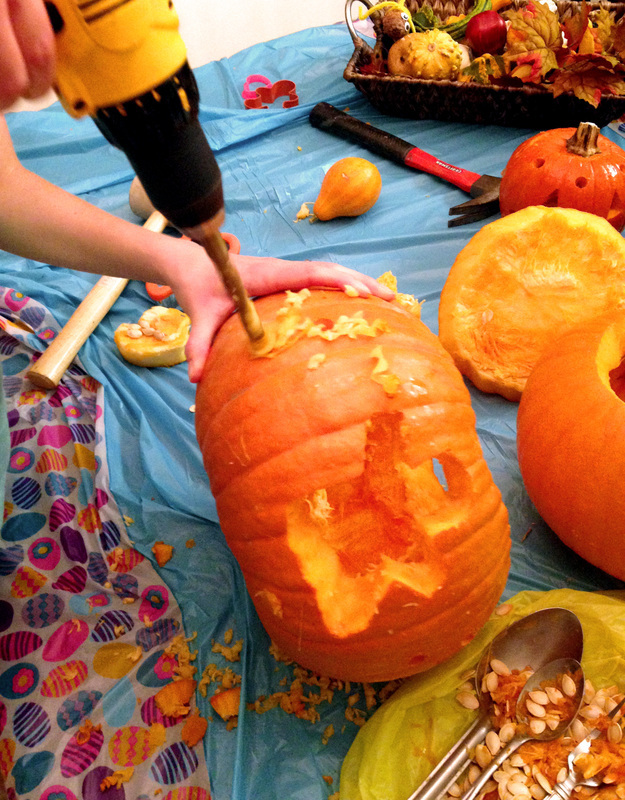 I had a blast drilling through the pumpkin. After cutting off the pumpkin tops and scooping out all that seedy goop, running a drill was undoubtedly the fun part. ​Now, it did make a huge mess, so you might want to drill outside. Yet, I just used the drill on a lower speed, and the flying pumpkin goop was minimal. Here are a few shots of the pumpkins sitting out on our front bench. Thanks Christine! Haha would love to! Cute idea! Carving is not my fave thing so maybe a power tool will make the task less ghoulish!! Visiting from Cooking and Crafting with JJ party. How creative. 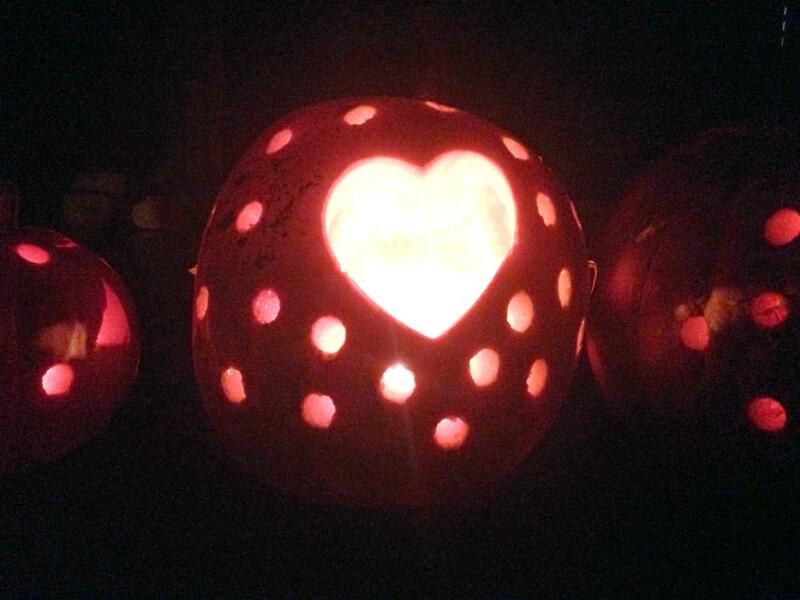 I love all of the pumpkins, but the heart is my favorite. Thanks for sharing on Sunday’s Best. Visiting from Coffee and Conversation. What a great idea. Love the holes. 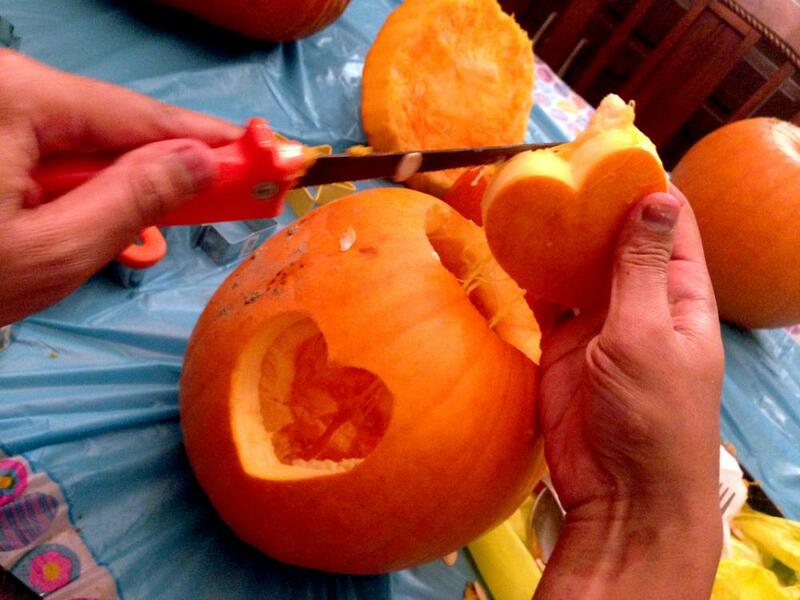 This definitely looks so much easier than trying to use a paring knife through that thick pumpkin flesh. Thanks so much for sharing at the #happynowlinkup! It was more fun too:) have a great week! How fun. We just happen to have a drill and tons of cookie cutters. Going to try this out for Halloween. Found you on Bloggers Pit Stop. I love the cookie cutter idea, that’s adorable! Thanks so much for sharing this at the Dishing It & Digging It Link Party. Hope you found some great new friends and had fun. Fun! I’ve done the holes before, but never thought of using cookie cutters. what a great idea. Thanks for sharing with SYC. 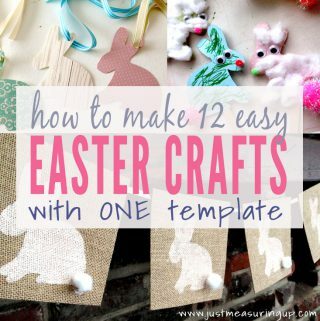 Fun, cute, different and easy to do. I like this idea for one of a kind pumpkins. Thanks Leanna! They were fun to make – lots of possibilities! That idea with the cookie cutter is very clever and so simple too. No more killing yourself with the knife trying to carve a shape.